Many of you are having daily dinner time battles. 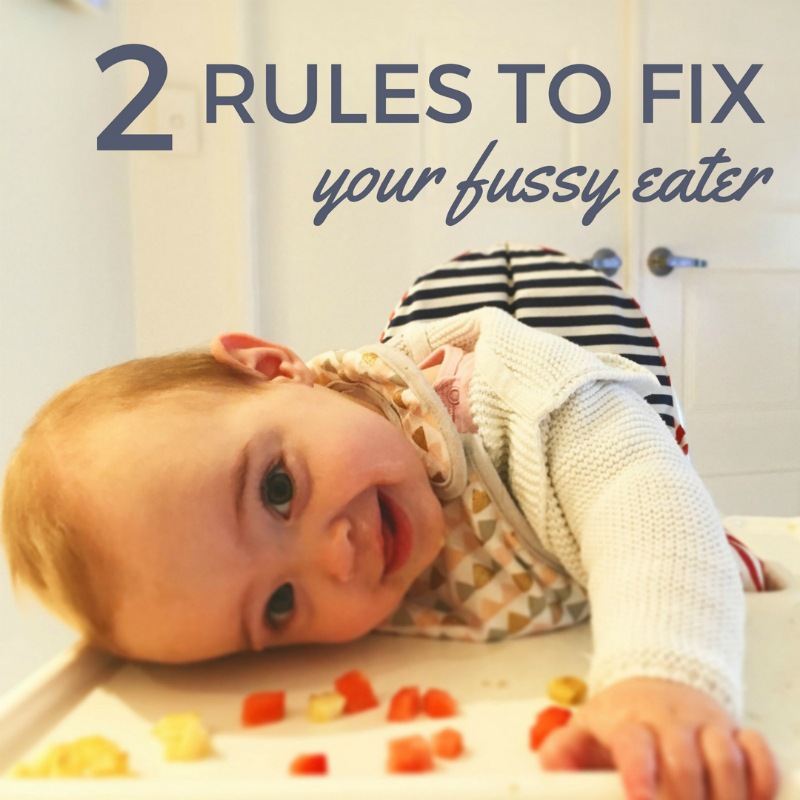 In fact, how to fix fussy eaters is my most asked about problem. 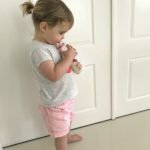 It’s really common for toddlers and children to have foods they regularly say no to. It’s also very common for children to refuse new, unfamiliar foods. You’re not alone. 80% of Australian parents are concerned about what their child is eating and a third worry their child isn’t eating enough. And the reason food was first refused might not be the reason they still won’t eat it! As frustrating as it is, pleading, bribing and rewarding children to eat their vegies doesn’t work. It can add even more pressure at meal times. Unfortunately there is no quick fix. We’re raising healthy adults here, we’re in this for the long haul. With that in mind, there are things we can do to make meal times less stressful in the short-term, and healthy foods normal in the long-term. These may seem obvious, but get each one of these right and the routine will set boundaries that will start to eliminate some of the battles. A child needs to be motivated by hunger to eat. 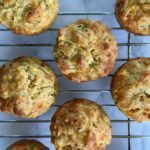 Time meals for when your child will be hungry but not over tired. Avoid milk or juice right before meals, offer water instead. Everyone needs to be sitting and eating together at the same time, as often as possible. Being stared at while you’re the only one eating is the quickest way for a fussy eater to lose their appetite. Eating your own meal at the same time shows off your good habits of eating healthy food, chewing, using cutlery and sitting nicely at the table – all very useful skills that need to be demonstrated to be adopted. Have a time limit for how long you expect them to sit and eat. A child will eat what they are going to eat in the first 30-45 minutes. Having a stand-off any longer than that isn’t going to see more food get eaten, and will make mealtimes unpleasant. You are in control of what is served – the kids shouldn’t be dictating this. Of course, cater to the family’s tastes and enjoyment of food but it’s your job to offer a healthy, balanced and appropriate meal. Accept requests and even offer a choice before you start cooking. It’s your job to decide that Cheerios and flavoured yoghurt is not a suitable dinner option. It also means you are offering one dinner. You won’t be going back to the kitchen to make something else if the first is refused. Or you will be setting yourself up for dinner orders and children who only eat dessert. Try planning meals so you have a record of how often different foods are offered. This doesn’t always mean eating them. A child needs to see a food 10 times before it is familiar, fussy eaters might not be willing to taste it until after 15 times. That’s a lot of uneaten broccoli, which will take a lot of patience and some planning. We’re good at mixing up meals for dinner, you don’t cook the same meal two nights in a row. But often we stick to favourites during the day. Having the same breakfast, snacks and lunches means that we are leaving most of the challenging foods for dinner. At the end of the day. When everyone’s tired and little tummies are unlikely to be motivated by hunger. Mix things up during the day to get them used to having a variety at other times of the day too. And you never know, your non vegetable eater might be more willing to try a pea or two at breakfast. Keeping the portions of challenging foods tiny will make trying it seem more achievable. What looks like a small portion to you might look like a mountain to them. Start with 2 peas or a 1/2cm cube of meat. This is a long process, baby steps are required. Offer a safe (known and liked) healthy food with anything new or challenging. There should always be something that can be eaten and enjoyed on the plate. Turn the TV off and sit at the table or kitchen bench together. Eating a meal surrounded by toys or TV is too distracting. As frustrating as it sounds, you need to let them decide what and how much to put in their mouths. Once the food is on the table your job is done. Remove the pressure by shifting the conversation away from the food. This includes positive pressure such as saying “oh isn’t this broccoli just delicious?”. If you can’t help talking about the food, stick to facts. Ask about the colour, flavour (sour, bitter, sweet) or the texture. No healthy child has perished from missing a meal they weren’t hungry for (or were too staunch to eat). In fact, most of us who are worrying about how much or what our kids are eating have perfectly healthy, growing children. It catches us off guard when our ravenous babies stop eating as much. But after 12 months of age their growth naturally slows, and so does their appetite. They will have growth spurts where they will eat more and then they will back off again. It is normal for appetites to fluctuate day-to-day. Just because they finished a whole sandwich and a piece of fruit for lunch yesterday doesn’t mean they need to today. Look at what they’re eating over a week or two instead of over the day – it will give you a more balanced snapshot. One of the main reasons we put on weight so easily as adults is that we don’t feel when we’re full, until it’s too late. Our children are very in tune with their bodies. They know when they’ve had enough and they stop. We are doing them a disservice by asking them to override their natural cues just to fit in a few more mouthfuls. Let them decide when they’ve had enough. Always start with small portions and then offer more if they’re still hungry. If they’re feeling vulnerable about eating, the last thing they want is a pile of food they don’t have the appetite for. Older children can serve themselves as it will help teach them portion control through trial and error. Remember your role and stick to it. Problems start when one side over steps their boundary. You decide what’s for dinner, but they control what they eat. Nagging, bribing and pleading is only going make those unappealing foods seem worse. Even positive comments can add pressure and be counterproductive. The best thing you can do is relax, be a good role model (especially dads) and remember we are in this for the long game. If you don’t have any short-term wins, rest assured they will surprise you one day when they’re older. they aren’t meeting their growth targets. They might recommend seeing a dietitian or a speech therapist. For more information about this approach to fussy eaters, check out the Ellyn Satter Institute. While I’m not on board with all the strategies in her books, the overarching principles on the website are great. If your child your child’s fussy eating is driving you nuts and you think you could do with some help, get in touch with me.